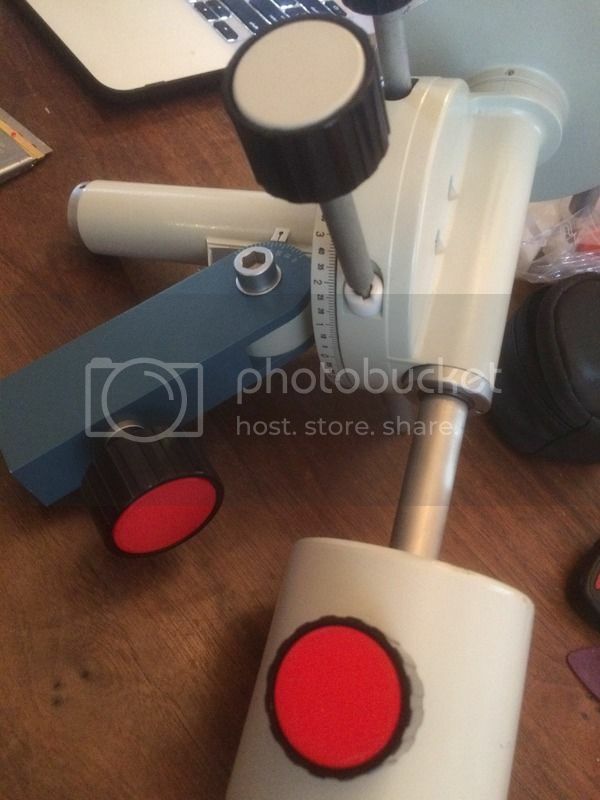 Thought I would start a thread containing links to my 3D printed "free" part files for classic telescopes on Thingiverse.com. 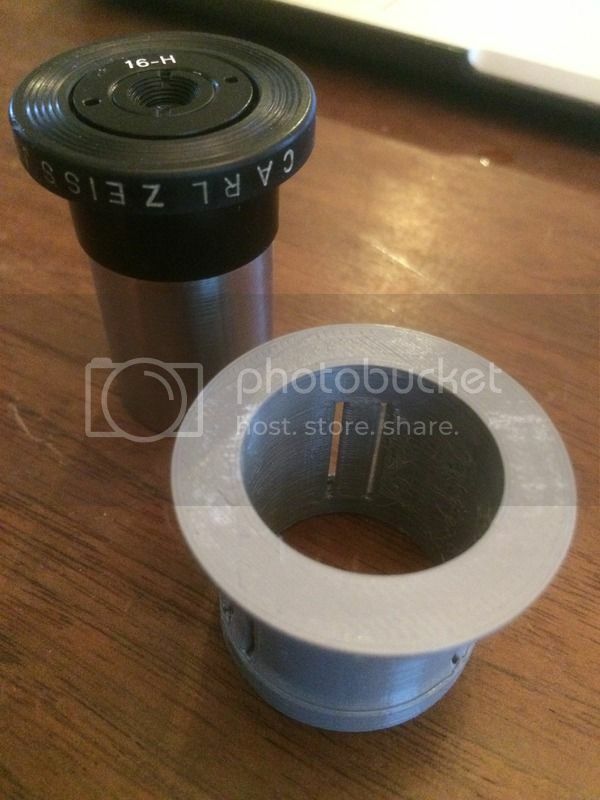 The first is a 0.965" to 1.25" eyepiece adapter I drew up along the lines of the plastic Zeiss eyepiece holders that use "springy" internal dimples to center and hold snugly the eyepiece barrel. Easy and very cheap to make, works great! Edited by Ben Bajorek, 13 December 2016 - 09:31 PM. 3D printing parts is incredible, I'm totally blown away by this. to myself, wow that is cool! 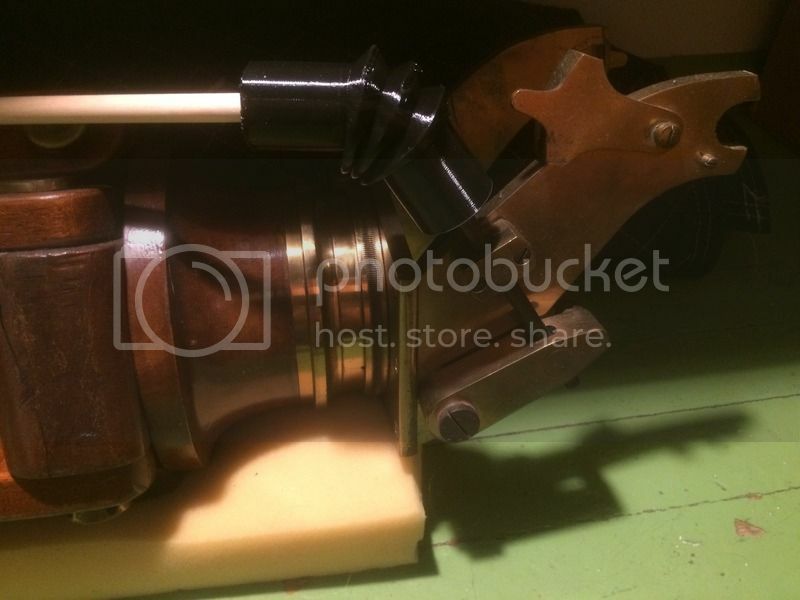 To see your telescope parts is even cooler! Edited by actionhac, 13 December 2016 - 09:47 PM. I have printed similar duty permanent sleeves for several of my nonstandard EP's with a super tight fit instead. As I don't think I'll ever need to use them with anything else. But if I need to, I can always just cut it out back and print another one as needed. That's the beauty of 3D printed prototyping - you can get an individual perfect fit any time and effortlessly redo whatever and whenever as needed. Nice! What I need are 2 sleeves for my Mogey. One would adapt the antique eyepieces, the other would adapt 1.25" eyepieces. I don't have a 3D printer, but I do have $$ for these parts. Ideally, they'd be removable, like the .965" to 1.25" sleeve I already have. Thanks Robert! I love Jay Leno's Garage, anyone who loves old cars and steam engines can't do much wrong. Leno's 3d printer back then was some kind of industrial machine that I'm sure cost well over six figures and required some technician to visit it once a week. My first introduction to 3d printing was back in the 80's when my father would bring home sample parts from his lab at Ford Motor that were printed with a very early stereolithography 3d printer. He would exclaim how revolutionary these parts were and we would look at the crude plastics chunks and laugh! I really need to start using my 3D printer. This is what I bought it for. However, having a 3D scanner would make it easier to duplicate parts. 3d scanner importance is overrated.  I see its utility in replicating an art (or really complex surfaces like a human face; I personnaly want to scan my head in order to print masks and goggles without resorting to foam spacers), but for anything practical you need just a sliding caliper, a decent CAD app, and some basic geometry knowledge. The accuracy of modern 3d scanners (at under $5k) is insufficient for direct printer driving and seriosly complicating CAD model processing on the astronomy related projects scale. Edited by halx, 14 December 2016 - 11:23 AM. .. So I have access to a 3D scanner. I thought I would dismantle my Edmund 1.25" focuser and scan all its parts. 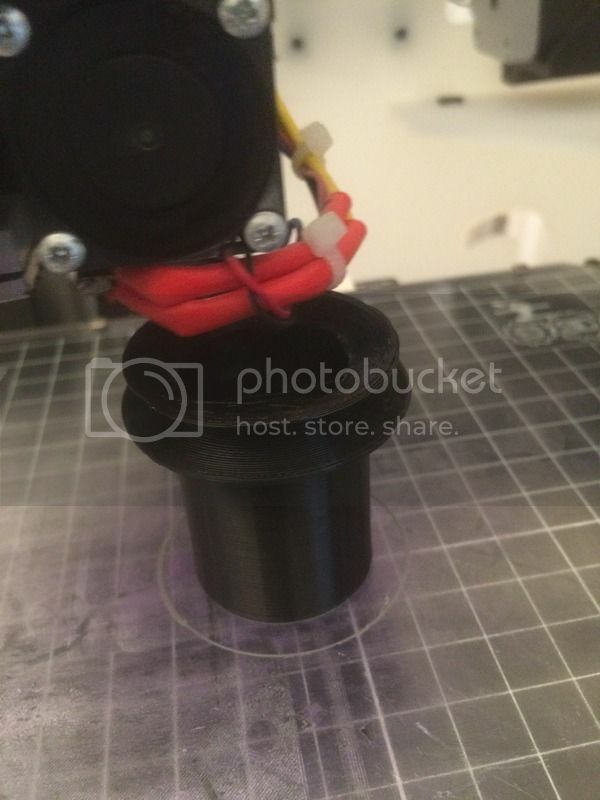 At the library they have a Makerbot printer that uses a tough black resin (something like ABS) , I thought I would print and assemble the new plastic focuser as a backup, or for another project. I also have a Tasco 9VR that I'd like to duplicate. I'm not sure I could accurately measure and enter the dimensions with a caliper. Or you could just buy one, or at least the black crinkle-finish cast-metal body for it. 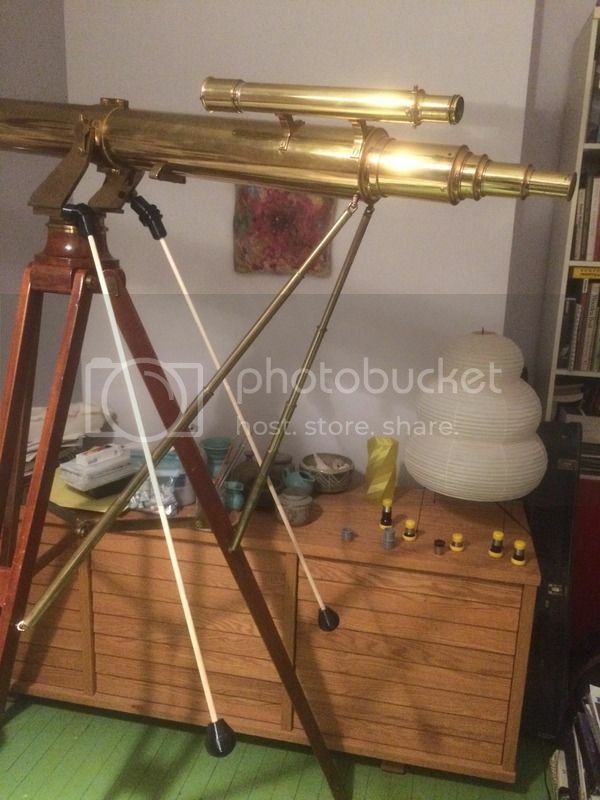 You have a 3" Edmund refractor IIRC? PS- I don't think you would be happy with plastic gearing. You can shop around internet and find the metal rack and matching pinion from several sources. A chrome finish metal 1.25" sink trap extender will work for the sleeve. Is that metal or plastic? Thanks! I don't know how I've missed this one on the SS site. I found only high priced items for gear racks. Do have a good source in mind? & worm drive.. Handy for fixing mounts. Terra is right. You wouldn't like what you get 3D printing any standard metal gears. Even though there are plenty of such models online - in the real life the accuracy of consumer grade 3D prints is less than 0.1mm. It is possible to "post-process" prints, but that will take a lot of time and experience, but wouldn't guarantee good enough results still. You need special engineering solutions instead. 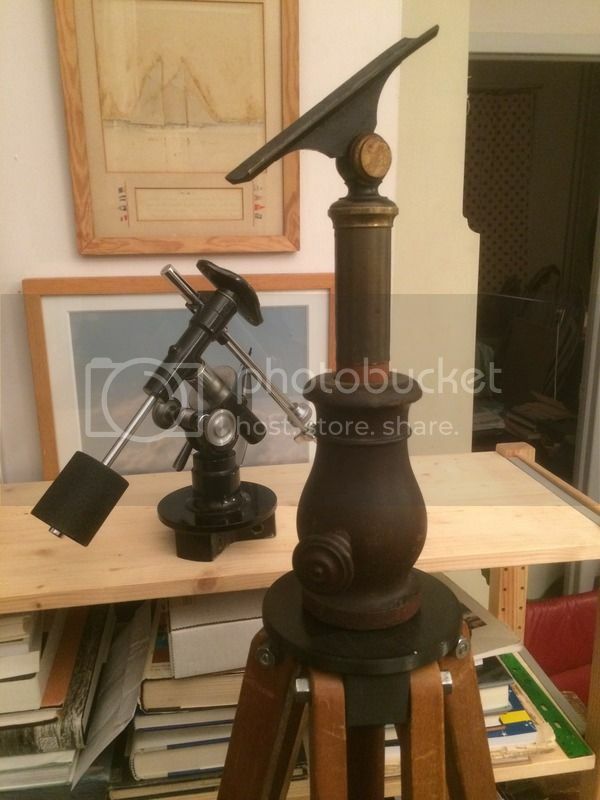 Like helical focuser with 6 angled rollers (don't remember the name). Unless you have access to a really high-end printer and acquire experience dealing with expensive advanced plastics. Alex, In my experience the accuracy of the the Reprap style FDM 3d printers in the .01mm to .03mm range is achievable. I'm talking about 3d printers that cost between $300 Printrbot Play to the $3500 Ultimaker 3. Most industrial FDM machines are not any better in accuracy, and with the newer stronger and easier to print plastic filaments most of their advantages have been lost. The market is transitioning from a model similar to the way the computer market went from main frame to micro. But don't get too excited, 3d printing is a much smaller market for the foreseeable future. That being said, the buzz surrounding 3d printing a few years ago is like all the hyperbola surrounding self driving vehicles today. It's certainly a scam when tech stocks get bought up on hyped up promises based on fantasies. And then everyone gets **** off at the technology when the stock prices collapse back to "reality". Edited by Ben Bajorek, 21 December 2016 - 03:48 AM. I can't believe that, Ben. The most practical nozzle size is 0.2 mm (otherwise it will print for ages and will clog often). Even if the nozzle positioning is rock solid precise with 0.01mm accuracy (which is always having some play) your typical plastics (PLA, ABS) are naturally expanding / shrinking unpredictably because of the almost unavoidable temperature variations (nozzle's temp and surrounding air's), because of the printing head vibrations, even because of your printed part's specific geometry. Add to that filament contamination from ordinary dust and moisture in the air, from oil on your hands, filament twisting and grinding in the feeder's gears, etc. No way it could produce 0.01mm precise parts to replicate polished metal parts like precise gears. 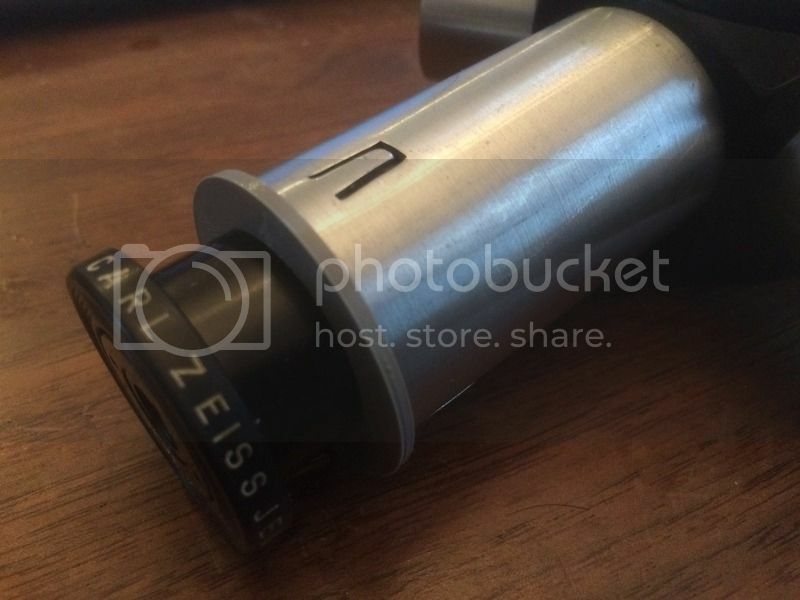 Your eyepiece holder on the image above looks indeed really neatly printed, though. What is the material and printing settings you have used? Any post processing applied? Edited by halx, 21 December 2016 - 01:37 PM. Hi Alex, Oh, you are correct. I was pretty much thinking about tolerances between different copies of the same 3d printed parts. Z height, the vertical dimension, is limited down to .05mm on my printer but the X and Y axis dimension accuracy can theoretically be about .01mm. But real world dimensionality is off those numbers. Still one can produce cool parts, while being home sick! Like I am today. Here are some drawings of a control rod flexible joint for my Cooke telescope mount. I'm making it out of a flexible polyurethane plastic, called SemiFlex . With it's internal structure there is really no other way to make a part with it's form except with additive methods. I'll post some more pictures when it's finished printing, so far so good. Edited by Ben Bajorek, 21 December 2016 - 03:59 PM. It's really works, nice motion hooked up to the old Cooke mount! The other shot is a progress picture as it was printing. Old Thomas Cooke would be smiling. 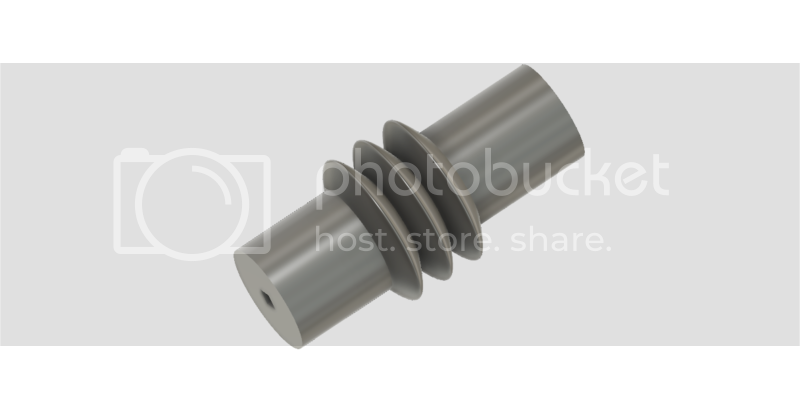 Here's the link to the files for the Cooke control rod parts, flexible joint and knob on a 3/8" wood dowel. 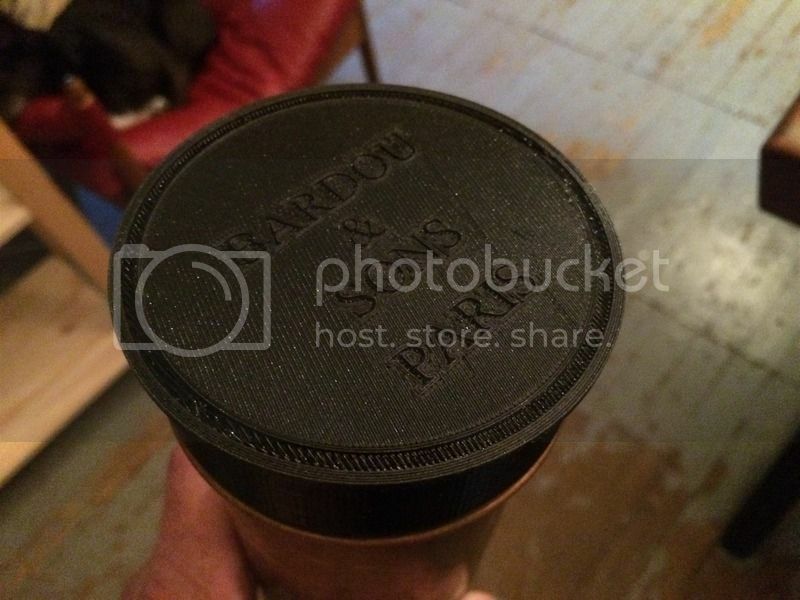 Remembered that Bardou objective lens cap? Here's a link to the file. You could scale the print for other size scopes. Edited by Ben Bajorek, 25 December 2016 - 12:05 PM. 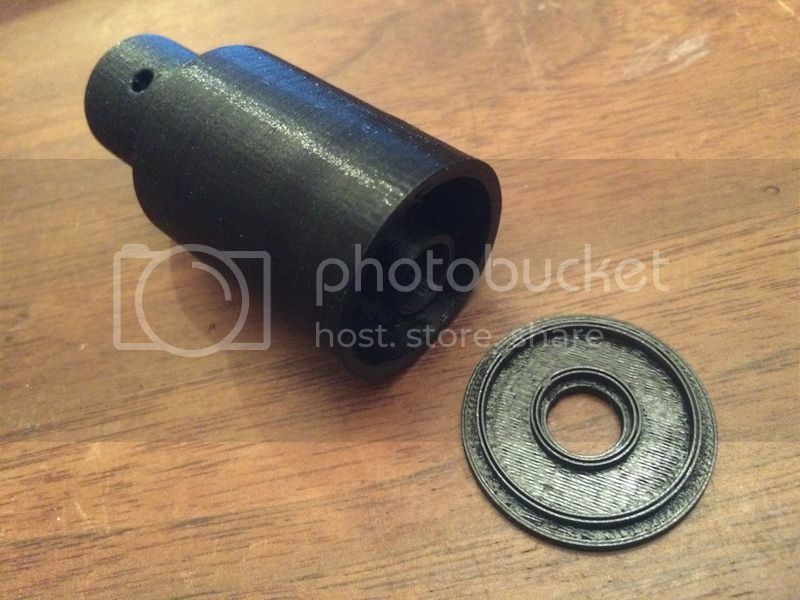 Another file, a 3d printed Bardou tripod trivet that uses the legs from a Unitron 118/128 telescope. I should have a file for the turned piece, the "eggplant",and thumb screw soon. The trivet isn't an exact copy of the original trivet. I went this way for added strength, wanted to be on the safe side. I should call it the Bardutron trivet. The Unitron 128 OTA counterweight file is here. 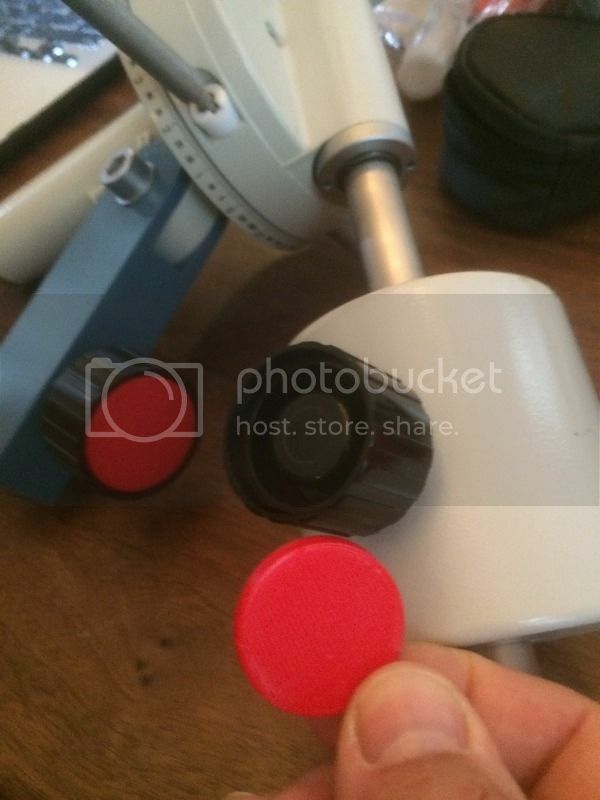 So the Zeiss Telementor mount I have was missing three of the red colored plastic disks that fit into the control knobs. They must have run out of red plastic for the disks at the Zeiss factory because of a rush order of bowling trophies for the Stasi bowling league, very understandable. Drew up the disks and printed them out in PLA plastic. Here's the link to the files. Edited by Ben Bajorek, 09 January 2017 - 11:21 AM. Funny! What goes around comes around! A major theme in this forum with regard to the high quality of classics is their all metal/no plastic construction as compared to the poor quality of contemporary scopes because of their use of plastic parts. And now we are making plastic parts for classic telescopes.